This is the directorial debut by Arraf, who is best known as the writing partner of Israeli filmmaker Eran Riklis on his two most successful films, The Syrian Bride (2004) and Lemon Tree (2008). At the moment, Villa Touma is most notable for being a film that is “stateless,” officially speaking. Set in Ramallah, Villa Touma is a film made by and about Palestinians that Arraf initially, quite logically, planned to send into the world as a Palestinian film. However, the state funding for the film is Israeli. This would seemingly make Villa Touma an Israeli-Palestinian co-production, but it seems that some Likudites in the Knesset spoke out against that scheme, claiming that a film 100% funded by Israeli sources is by definition an Israeli film, case closed. Then, you also have the fact that the film arrives in the midst of one of the worst ground offensives by the IDF into Palestine in many years. And of course, while Gaza may be Hamas’ primary stronghold, Ramallah runs a close second. If we were still in the era of 35mm print traffic, cans of Villa Touma might very well have been stuck in an airport terminal alongside Tom Hanks with a lame Eastern European accent. Sadly, the political and bureaucratic hubbub around Arraf’s film is far more interesting than the film itself, which takes on a seldom-explored historical topic and extrudes it into bite-size shells of utter cliché. After aging out of an orphanage, young Badia (Maria Zreik) goes to live with her three bitter, repressed aunts. This group of once-aristocratic Palestinian Christians hasn’t been faring too well since the 1967 war, but they choose to deal with the problem through delusion and anachronism, rotting away inside a slightly less rat-infested Grey Gardens universe. As for the relationships among the women, the old family home Villa Touma would be more approriately called House of Horizontal Violence. 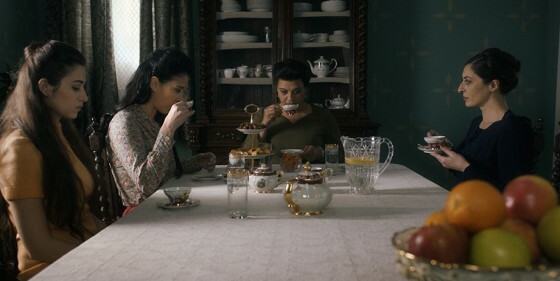 Matronly Juliette (Nisreen Faour) is all about tea parties and decorum, setting up humiliating, outdated rituals to try to marry Badia off. Violette (Ula Tabari) is embittered about growing older; she covers her bedroom mirror with a white sheet and prances around in her old wedding dress. Youngest aunt Antoinette (Cherien Dabis) is the most sympathetic to Badia, but she is too weak-willed to stand up to her older sisters’ regime. Still, when Antoinette and Badia are alone in the oppressive manor, they sneak a moment to dance with wild abandon. You can envision the next scene in your mind with absolute clarity because you’ve seen it a thousand times: Juliette catches them unawares and rips the needle from the record with an authority and flourish that would make Jonathan Edwards blush. As I say above, Villa Touma takes on the Arab-Israeli conflict from an unusual angle: we tend to forget about the (mainly Christian) prewar Palestinian bourgeoisie, as well-situated and thoroughly displaced as the pre-revolutionary upper class in Iran. Alas, Arraf avoids the question by wallowing in standard-issue cinematic depictions of older women taking cruel delight in punishing the young.